Easily check for the doneness of meat without using a thermometer by comparing how the meat feels with the feeling of your hand as you touch different fingers together. There are two basic methods to test for how done your meat is while you are cooking it—use a meat thermometer, or press on the meat with your fingertips. 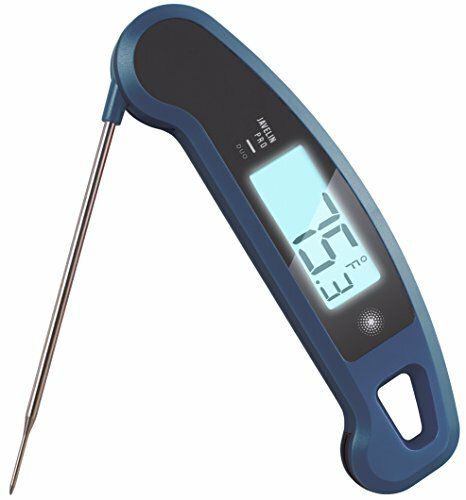 The problem with the meat thermometer approach is that when you poke a hole into the meat with a thermometer, it can let juices escape, juices that you would rather have stay in the meat. For this reason, most experienced cooks rely on a “finger test” method, especially on steaks (whole roasts are better tested with a thermometer). My mother has been trying to get me to test meat with my fingertips for years, and for years, being somewhat of a scaredy cat (won’t it burn my fingers?) I ignored, avoided, ran away from the idea. Then my friend David showed me up. Here’s a guy who loves to grill but doesn’t know how to boil water. (Really. Cannot boil water. Just ask him, he’s proud of the fact.) David taught me how to test for the doneness of meat using this method and these days half the time I don’t even bother with a thermometer. Now the point of this story is not to embarrass David (though that would be fun, if it were even possible) but to encourage you, if like me, you’ve been shying away from trying this approach. This really isn’t rocket science. This is one of those things that gets easier with practice. The next time you cook a steak, even if you are still planning to rely on a meat thermometer, press on the meat here and there while it cooks, and compare the feeling of the meat with the following finger test. With practice, you will become more confident. Press the tip of your ring finger and your thumb together. The flesh beneath the thumb should give a little more. This is what meat cooked to a medium doneness feels like. Gently press the tip of your middle finger to the tip of your thumb. This is medium rare. Press the tip of your index finger to the tip of your thumb. The fleshy area below the thumb should give quite a bit. This is what meat cooked to rare feels like. Open up your palm again and compare raw to rare. Hello! All photos and content are copyright protected. Please do not use our photos without prior written permission. If you wish to republish this recipe, please rewrite the recipe in your own unique words and link back to The Finger Test to Check the Doneness of Meat on Simply Recipes. Thank you! Absolutely the best way to cook steak like each family member likes it; been using this method for years. Though I would take exception to the often repeated “losing juices” claim. But that doesn’t negate the tip, I find it quicker to do the finger press then trying to hold an instant read thermometer over the grill. Blessings on you & your household, steak guru. The test I used to learn is using the part between the thumb and first finger. The very outer part of the “web” is raw, move in a little and that’s rare, more is medium, and at the hand is well done. You can feel these spots with tongs n then try the steak…. just another way to do about the same thing. Regarding the risk of letting the juices out when using a thermometer: it may be best to test the temp after resting. That way it will have reached its final temp and the juices will have settled. Absolutely love the “press” test. Will use forever. I like very rare meat and always seem to overcook it. Thanx so much. Yeah standard chef routine. It’s not foolproof but 90 odd percent of the time it works. The trick is to keep your palm relaxed. I keep trying to feel the difference between all these finger positions and I think I’m being punk’d. Maybe I burned all of my nerve endings in the minus 80 freezers at work. Oh well. Michael, you’re not trying to feel different temperatures on your hand, but a different firmness as you move your thumb to each finger. You want to feel the same firmness on the meat, as it feels on your hand. further more on that, most places don’t wear gloves when preparing food. A study found that people who wore gloves were often more careless because of the “false sense of security” that gloves= cleaner. The people often reused gloves and cross contaminated food items..
vs people who prepared food without gloves and just kept their hands clean. Aged beef is allowed to go bad. It’s kept for 21 days at a specific temp and humidity. The bacteria has a field day on the outside but that part gets cut away and the inside is still perfectly good and safe. It’s probably best to use a thermometer with ground beef patties. The grinding of the meat allows bacteria to get inside. I actually like burgers a little pink (and juicy) inside, unwise perhaps. I would be more concerned with store bought ground beef. I grind my own so I know the meat is fresh and everything is clean. But I have seen people give their burgers the finger…so to speak. I think liver is the most dangerous meat to buy in the store. Because nobody buys it, it’s most likely to be bad when you get it home. I love it and it’s cheap but you need to pay close attention to the color. Without being able to smell it that’s the best way to know if it’s on the way out. Liver and onions fried with green beans and bacon fat…yummy. I have a question for you: Does this method work for large pieces of meat, for example: 12 lbs of pork shoulder? Hi Ravan, this method does not work on large pieces of meat. For roasts you need a meat thermometer. Or if it’s pork shoulder, you cook in low and slow until it is completely cooked through and falling apart tender. No need for a thermometer, if it’s so tender you don’t need a knife, it’s done. Haha, I saw this on here a long time ago and have been using it since. Takes a few times to get used to the feel but after that, smooth sailing. Awesome stuff.